The black rhino and the white rhino diets are very different. That's partly because of the black rhino's prehensile lip -- basically a pointy lip that allows him to tear and pick up stuff easily. The white rhino, on the other hand, has more square lips, so he can't break things to eat and as a result can't consume harder stuff like branches. Both types of rhino are affected by the seasons, with their diets changing depending on what's available around them. The black rhino's diet consists of just about 40 percent grass. The rest of his diet is composed of twigs, leaves and even small branches. Although black rhinos will pick up things to eat from the ground, they will also take small branches and twigs, as well as fruits, directly from trees and shrubs. In some cases, black rhinos will dig up some edible roots using their horn. The amount of food consumed depends on the season -- during rainy season, the greenery is more abundant so the black rhino might eat more or choose slightly different things than when everything's dry. 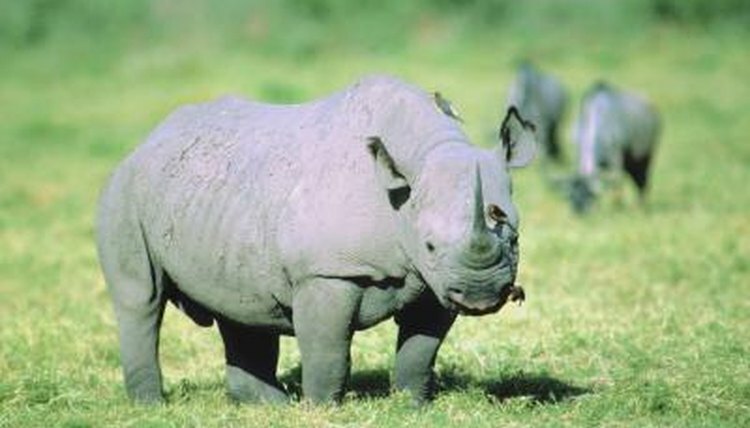 Black rhinos can go for several days without water if they're eating lots of grass and leaves. However, if they're eating lots of twigs and branches, they can only go one day without drinking. Because they don't have a pointy lip to help them break twigs or dig for roots, the white rhino eat basically just short grass and some leaves. Rhinos are considered grazers, because they will eat constantly throughout the day, rather than having set meals. White rhinos can go up to five days without drinking, because they get some moisture from the grass they eat. White rhinos tend to walk around with their head down, close to the ground. They do this to take advantage of the grass as they walk around, grazing non-stop. Black rhinos walk with their heads up because much of their food comes from trees. Rhinos in zoos are fed a diet that consists mainly of soy and alfalfa. Although they can digest both of these things, they are not what they would naturally eat in the wild. The change in diet might be responsible for the low birth rate of rhinos in captivity, according to researchers from the San Diego Zoo Institute for Conservation Research. Soy in particular causes a direct effect on phytoestrogens, a type of estrogen that affects the reproductive cycles of animals.